Vancouver's weather is very unstable recently. It rains almost every weekend. Weather forecast is not always accurate. Luckily, it didn't rain until we finished the e-session for Crystal and Andy today. The photo session was a lot of fun. This couple are absolutely gorgeous. Crystal told us about her engagement in Naomi's wedding. We took a sweet kissing shot for them as a little celebration. We look forward to shooting more beautiful pictures for them in their wedding. It's Jessie's turn this time. 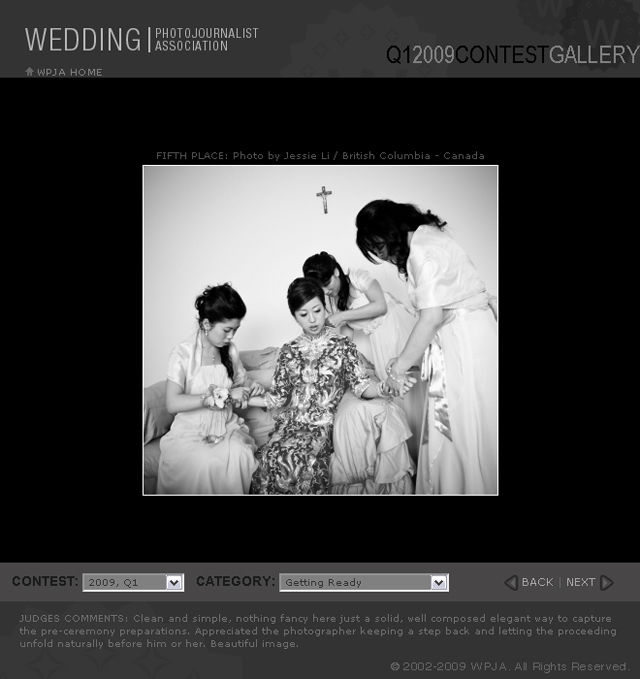 She had an award winning photo in quarter 4 of 2009. This is her 3rd winning in year 2009. We should thank Novan and Gary for their trust. This shot was taken at the middle a busy road in Vancouver Downtown. It was sunset at that time, and we had to take the shot within 30 seconds before the traffic light turned from red to green.